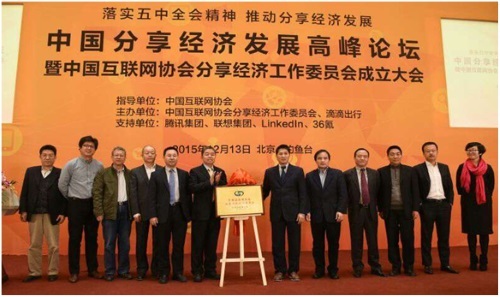 BEIJING, Dec 15, 2015 - (ACN Newswire) - The Commission on Sharing Economy of China (CSE) was inaugurated yesterday in Beijing under the Internet Society of China. Co-founded by Didi Kuaidi, Tencent, the Lenovo Group, Linkedin (China) and other industry leaders, the CSE is expected to play a key role in the communication and coordination among businesses, regulators and opinion leaders to promote the healthy development of the internet-based sharing economy in China. As the world's largest mobile-tech market with over 700 million internet users and 530 million smart phone users, China is a hotbed for cutting-edge mobile search, payment and identification technologies. In the meantime, a sweeping urbanization process fueled by economic growth is raising general environmental and resource challenges to citizens and regulators, creating broad social and infrastructural support for a nation-wide sharing-economy initiative. As a practitioner and leader in the sharing economy, Didi provides flexible on-demand rideshare services to 250 million users across over 360 cities on a one-stop mobile platform that links tens of millions of professional and part-time drivers and vehicles through dynamic resource allocation algorithms. LI Jianhua, Chief Development Officer of Didi believes in addition to helping cities alleviate congestion and pollution, the sharing platform helps discover new values for work as it fully brings out the power of collaboration and innovation. Li Said, 'The sharing economy model changes lives; and it gives businesses great opportunities to fulfill their social responsibility. On the CSE's new platform, Didi will continue to work with peer businesses, regulators and opinion leaders to realize this new vision of growth and empowerment'.